Home » People & Culture » Happiness is Coming! For the first time in years the people have a chance to vote. It’s a straight up or down vote – do you want to continue the brutal regime or do something different that isn’t all that well defined? If that sounds like an impossible situation, it’s what was facing Chile in the referendum on Augusto Pinochet on 5 October 1988. Many wanted to boycott the whole deal as a sham, a fake that was sure to be rigged. Some wanted to use it as an opportunity to document the murders of 3,197 political opponents or the torture of more than 29,000. But some wanted to win. And how they did it was with a positive message and an upbeat anthem that convinced the nation that “Happiness is coming!” (Chile, la alegría ya viene!) If it seems unlikely, it’s brilliantly retold in the movie “No,” nominated for an Oscar. You must see this movie – but more to the point, we all need to understand the message. Democracy and an open society flourishes when people can see their future together – hope, pride, and happiness. The referendum was forced on Pinochet after 15 years by a wide range of international pressures. The GHW Bush administration was urging a return to democracy, leaving Chile estranged from its one real friend during the regime. 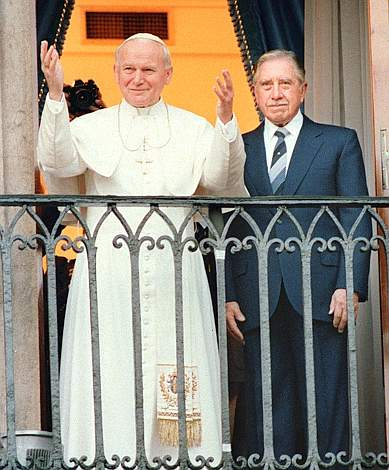 Pope John Paul II visited Chile the year before, urging Pinochet to resign and call free elections in a semi-public meeting with his generals. The nation had plunged into stagnation and isolation, with 45% living below the poverty line. Occasional attacks by a loosely organized group of communist rebels kept everyone on their toes. Con las armas de la paz. With weapons of peace. Porque creo que mi Patria necesita dignidad. Because I think my country needs dignity. Por un Chile para todos, vamos a decir que no! For a Chile for all, we say no! The “No” vote won 55-45, and Pinochet eventually agreed to step down in favor of free elections. In the 25 years since, Chile has never looked back – and has prospered wonderfully. Happiness came to Chile. The lesson is far more than how to bring down a dictator with a song. No matter how dark things seem it is a positive vision of the future that gathers the young people who will make that future happen. That could be simply “Hope”, as Obama gave us in 2008, or it can be a similar song, “Happy Days are Here Again!” at the end of the last Depression. Life is, after all, about happiness. Freude, schöner Götterfunken. That’s why we have a free and open society – to promote life, liberty, and the pursuit of happiness. Given the nature of the referendum in Chile it would have been far too easy to use Saul Alinsky’s advice for organizing – “Pick the target, freeze it, personify it, polarize it.” Those tactics have worked well for, of all people, the Republicans lately. But that is a message of division which plays naturally into fear. A free people have only one thing to fear, and that is fear itself. A strong vision of freedom is a vision without fear – a vision of happiness first and foremost. If Chile can do it after their darkest days, we can too. There is a message here beyond hope and happiness – the message is that this is how you make the future for a free people. We should all learn from the example of brave Chile. Happiness is coming! This entry was posted in People & Culture, Politics and tagged 25 October 1988, Chile, No, Pinochet. Bookmark the permalink. Inspirational, and your right that a positive message will work far better than a negative one. The negative campaign ads worked pretty well for years but pols like Wellstone and Obama were always able to overcome them with a positive message. I don’t know why that wasn’t better understood but it appears true. Now people seem totally turned off by negativity and I’m sure its even more true than before. I believe you are right, especially in that this has been shown time and time again. But it takes skill and determination to avoid revenge negativity, especially among challengers. But when the power responds with a character attack, they are in fact showing weakness – something which came out rather plainly in the movie. A positive message is essential for the Democrats to be resurgent. It would help to be backed with real legislation and a solid agenda, but the movement has to be positive. That I am sure of. Look at the Minnesota “No” campaign this last time. We could have dwelt on homophobia and so on – but didn’t. And it worked, yes? Amazing, I never heard of this before. Thank you! I had not heard this song or seen this commercial before. But we didn’t have social media to share things back then. We do now, and we can still learn the lessons! Glad to hear you saw this movie. I will see two other films that include a police state. “‘Winter of Discontent” at the arab film fest in Mpls. Three main characters a young woman reporter who covers the uprising, a tech guy who uploads her stuff, and the police chief who jails the guy and tortures. Plus a cast of thousands in the streets. Opening this weekend is “Barbara” about a young woman doctor who tries to emigrate from East Germany in 1980. She is captured and sent to work in the rural interior where she is closely monitored. A movie about character and not so much on plot. I like foreign movies, generally. I think they are pretty heavily screened before we get them, so what arrives here is only the best. There’s a lot to learn from other peoples’ experiences, IMHO, and film is one way to do it! My first thought is “you can catch more flies with honey than vinegar” but I know you mean more than that. It’s hard to be excited about the future and want to work for something together if it’s all about sacrifice. That is what is wrong in congress right now and why people don’t seem to care much about it I think. Yes, that’s basically it, but to really get people excited about the future it does take a positive. No one ever stayed excited about austerity, which is a lot of the reason we’re in this situation, yes. I saw this movie as well this weekend (could we have been in the same theater?) and think there’s a few more points to mention. One – how the campaign embraced humour so well, and broke through the outer crust of pain to call upon that better part of ourselves that in the end, is stronger than anger, resentment and fear. I struggled watching this far left group use traditional (manipulative?) advertising tools, including highly emotional symbolic images,TV celebrities, and a catchy “jingle”, to win over a highly skeptical and fearful audience. It seemed so cynical and contradictory to their purpose and vision. Yet, part of their victory was overcoming both the tendency to complain about the past and about how the right doesn’t play fair in the media – and to fully exploit the power of the positive and take full advantage their skill and talents to say so.. They never apologized for winning. A critical adjustment I think that we could all learn from. Selling the “No” the way they sold a new cola was dealt with very well, I think, and it left us to make our own opinion about the situation. I haven’t digested that part yet, to be honest. But reaching deep down and calling upon the most basic impulses of good people was so very important – and that’s the lesson I hope we can learn it. It’s so easy to demand retribution – or even demand justice – but the real justice comes in not letting those who abuse power hurt anyone anymore. So put together a movement with a positive message and do it. It’s not like there aren’t enough things that need to be changed. You are right. Let’s get something started! For a first pass, I’m thinking of how to support the Simpson-Bowles “Fix the Debt” group. I have been told that futbol fans still use “Chile, la alegría ya viene!” as a chant when the national team is playing. That sounds simply wonderful! It’s worth noting, too, that “alegría” doesn’t really mean happiness – it translates better as rejoicing or something much more active. I used the translation “happiness” only because it seems to be the universal way to refer to this song en Inglés. Porque digan lo que digan yo soy libre de pensar. Hasta cuando ya de abusos, es el tiempo de cambiar. Porque basta de miserias voy a decir que no. Porque pienso en el futuro voy a decir que no. Vamos a decir que no, por la vida y por paz. Con las armas de la paz. Porque creo que mi Patria necesita dignidad. Por un Chile para todos, vamos a decir que no. Vamos a decir que no, por la vida y por la paz. Chile, la alegría ya viene. Because whatever they say I am free to think. With the abuse is the time to change. Because of the miseries I’ll just say no. Because I think about the future – I will say no. Let’s say no, for life and peace. Because I think my country needs dignity. For a Chile for everyone, we will say no. Let’s say no, for life and for peace. Thank you for the words in english for the rest of us. That is very powerful and inspiring! You are most welcome! I love this song, and I cry every time I play it. I find it so beautiful that words cannot describe it.